A local college was designing an air cannon to launch pumpkins for their engineering class project. They were looking for a large diameter valve with a fast acting actuator to provide the air capacity they needed. 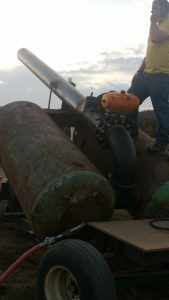 Assured Automation was contacted to help find a solution to their Pumpkin Chunkin valve assembly requirements. The sales engineer suggested a ST Series Butterfly Valve with a F Series pneumatic actuator. The ST Series butterfly valve allows the air stored in the reservoirs to exhaust quickly. This valve features a stainless steel disc and stem and is able to withstand higher pressures and continuous actuation. The F Series rack and pinion actuator provides fast quarter turn operation to cycle the valve quickly. The light weight aluminum body helps reduce the load on their system and the corrosion resistant polyurethane coating keeps the unit looking brand new even in harsh environments. The students tested the Assured Automation assembly and it performed perfectly for their quick exhaust design. They competed in a local Pumpkin Chunkin contest and impressed the crowd with their explosive launch! This entry was posted in Latest News and tagged Air Cannon Valve, F Series, Pneumatic Actuator, Pumpkin Chunkin Valve, Resilient Seated Butterfly Valve, ST Series. Bookmark the permalink.